Posted in: Art, Music, Photography. 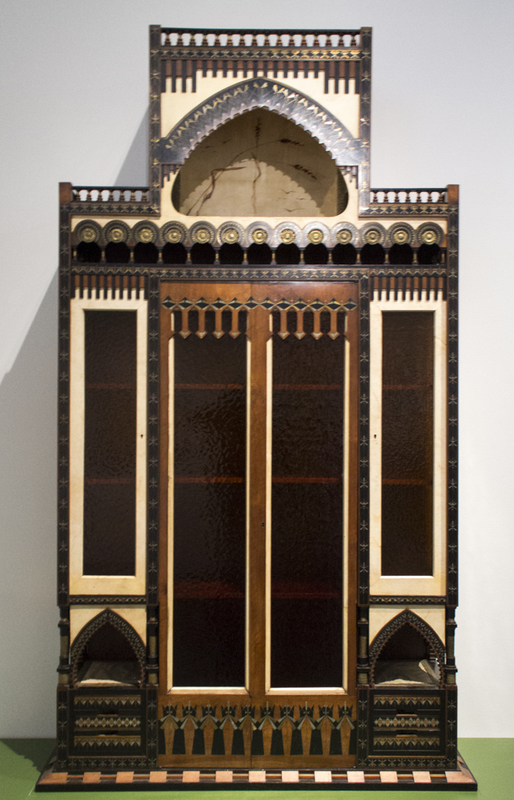 Tagged: 1890, Cabinet, Carlo Bugatti, design, international architectural, Japanese ink, Lou Reed, Muslim Spain, Nelson-Atkins Museum of Art, White Prism. This monumental cabinet reflects the range of international architectural and design elements that inspired Carlo Bugatti. The brass roundels and minarets above the doors are based on Moorish designs from Muslim Spain. The central panel is inspired by Japanese ink painting. The extravagance of detail indicates that this cabinet was destined for an elite client. Most likely used as a centerpiece in a room, it probably held books and important documents behind lock and key. Such craftsmanship is amazing, such a beautiful work of art. sigh. I can only imagine the room this would have been in. I assume this is the same family that created the very stylish sports car a few years later? Same family and yes this cabinet was fairly large.